With the nearest doctor 45 minutes away on foot, we realized early on that we needed a doctor to help our students and villagers. We built a medical clinic on the school site and employ a doctor who lives and works here during the week. He treats everyone, whether or not they can pay for his services. Our waiting room is often full, especially in winter when pneumonia is common. And we provide donated medications such as vitamins, antibiotics and painkillers that he prescribes. Previously treatment was often out of the question, since villagers simply don't have the money for bus fare to the city or for high pharmacy prices. 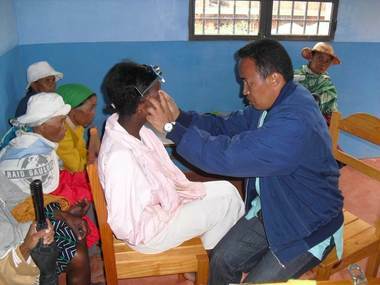 Every two years we bring an opthalmologist to the village for eye care and to fit villagers with donated prescription eyeglasses. Parents are sometimes reluctant to accept the gift of eyeglasses for their children since they know they can't afford to replace them. We tell them that we will do all we can to keep students supplied with glasses until they can earn their own living.